Sue Owings and the children sign The Navajo Prayer at a Thanksgiving service in 2018. 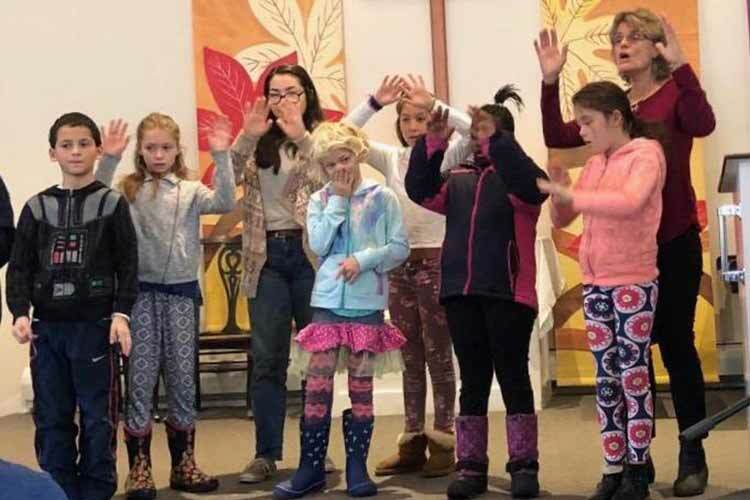 On a Sunday morning following the children’s story, the children clump down the stairs and the sounds of singing, laughing and lessons drift up as Sunday School absorbs kids through the fifth grade. The very youngest are cared for in the nursery. Sixth graders meet for Confirmation Class with the pastor at 9:00 on certain Sunday mornings, and go through a process to decide whether to join the church. They also help raise funds for the Drop In Center and just plain have fun with movies and pizza. The middle school youth meet during the Sunday School time for study, discussion and activities on some Sunday mornings, and stay through the church service on other Sundays. They raise funds for the Drop In Center and for their mission trip to St. Croix, and take part in social events and service projects. High school youth are involved with the Brattleboro Area Interfaith Youth Group, BAIYG. In 2019, teens are spending the school year planning and fund-raising for a trip to volunteer with the organization “Simply Smiles”. As they did for the past five years, they will be working with children on an Lakota Tribe Reservation in a summer camp and helping with odd jobs and construction as well. The trip will happen in July, 2019. Follow their trip on the Guilford Community Church Facebook page.